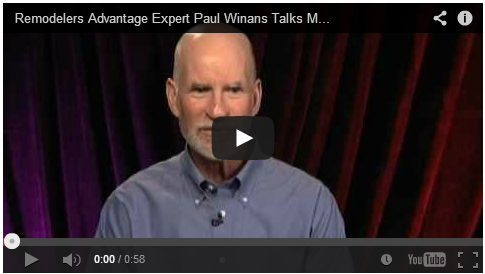 Every remodeling business owner has learned painful lessons, and in his 29 years of running Winans Construction, a design/build firm in Berkeley, Calif., Paul Winans learned more than his share. For many of the early years (he and his wife Nina incorporated in 1978), he was a stubborn and hot-headed business novice who threw himself into his work and the impossible goal of pleasing every client and prospect. Even as the business grew, Paul felt alone, frustrated, frightened and lost. Years of soul-searching included counseling, working with business consultants and "continuous epiphanies" about changes he had to make to his behavior and expectations. He had a much clearer perspective by mid-2007, when he and Nina sold their business and moved to Ashland, Ore., where he now consults through Winans Consulting and is a facilitator with Remodelers Advantage . We spoke with Paul about his journey last week, in preparation for a presentation he'll be giving October 17 at The Remodeling Show in Chicago .See also this d5R profile of Paul from 2010, as well as last week's d5R Remodeling Show preview on the changing consumer . "I was not the person I wanted to be," said Paul (shown below in 1978). "I decided to stop being a prisoner of my habits and, among other things, believing that I could make all of my clients happy." Pleasing everyone is impossible, of course, and when things didn't work out as planned — projects went over budget, clients became unhappy or even abusive — he found himself blaming others. "If you're not honest with yourself, your motivation is misplaced," Paul said. "You keep blaming others when the primary source of your pain and frustration is that the fact that you're not taking responsibility for the only thing you can control, which is your behavior." Read The 7 Habits of Highly Effective People , by Stephen Covey. Have your staff join you in reading and discussing this and other business books. Learn to trust your gut in selecting clients and projects. "Some projects would have cost us less if we had simply paid the potential client to go away," he said. Regarding the last point, an especially painful example was a project they took in the early 90s, when the Bay Area was still buried in recession. The job was referred by an architect who was no longer involved with it, was in an area where the company hadn't worked, and was for a couple who were equal parts condescending, cold and ultimately litigious. Red flags all around. Setbacks didn't have to be crises, Paul learned over time. "I had to realize that everything is a journey, not a destination, and that just because I cared about something did not mean I should be devastated when it didn't go perfectly." Pay attention to what is going well. Tell others of your desire to change. Be realistic — somewhere between optimism and cynicism. When something or someone is sub-par, take written notes, give it time, and then discuss the issue with the key employee's direct manager. Along the same lines, Paul learned to not expect perfection. "Life happens, and the truth is that being a remodeling contractor hinges on reducing surprises as much as possible. You'll never eliminate them," he said. In the video below, he discusses how systematizing sales can help to minimize surprises involving inadequate lead flow and poor matches for your company. As many remodelers have learned from reviews on sites like Angie's List and Yelp, homeowners often focus far more on what goes wrong than what goes right. Don't make that mistake with your business. "My struggle was to only see what was not perfect," Paul said. "I actually put reminders in my schedule to 'praise somebody' and 'place no blame.'" From underestimating project timelines to overestimating homeowners' understanding, mistakes are inevitable in remodeling. "It took me a while to accept that," Paul said. "Over time, I learned that it was my choice how to react or respond." Hold a job completion review/job autopsy. Avoid saying "Why did you do what you did?" Say instead: "What could we have done differently?" and "What makes the alternative a better solution?" Attempt to problem-solve as a team. Learn to delegate effectively, in part by holding a weekly meeting with each person you manage. Work with team members to develop written systems for company processes. Figure out what only you can do — and find others who are good at doing everything else. For key tasks, write down what you will tell employees, and have them write and explain their understanding, including deadlines and check-ins. above: Paul and Nina (center) receive the National Remodeling Quality Gold Award in 2002. Be specific with each department (sales, administration, production) about who should do what and how everyone should work together. Praise publicly what went well in any given task, discuss privately what could have gone better, and use the results to refine your systems going forward. Work with the company as a whole to define your mission statement, core values and vision statement (specific goals to achieve by a specific date). Plan and discuss with your trade contractors, vendors, architects, building inspectors and others outside your business. above: Nina and Paul Winans at their home in Ashland, Ore.